[Updated] The Executive Board of the International Triathlon Union [ITU] met in Australia, and after reviewing the bids of the different cities, the ITU Executive Board decided to award the 2021 ITU World Triathlon Grand Final to Bermuda. The ITU’s announcement said, “The Executive Board of ITU has met during two days in the Gold Coast, in Queensland, Australia, just ahead of the ITU World Triathlon Grand Final to debate and decide on several important issues, including the 2019 competition calendar, the new services for National Federations or the cities that will host the 2021 and 2022 Grand Final. “After reviewing the bids of the different cities interested on hosting our major events, the ITU Executive Board has decided to award the 2021 ITU World Triathlon Grand Final to Bermuda, with Abu Dhabi hosting the Grand Final in 2022. “The Board also discussed the 2020 edition of the Multisport Championships, and decided to award it to Almere, in the Netherlands. “I am really satisfied of the intense work we have done, especially on two main aspects for our future as an organization: the cities willing to host one of our major events, and the development programmes and the way we work with the National Federations in order to continue to push our sport and bring it to the next level of participation and engagement”, said ITU President and IOC Member Marisol Casado. “I feel really confident that with the work that we have been doing during last year, and the commitment from all the Board members and ITU staff, we will continue to push our organization even further. Update 12.22pm: The BTA said, “Bermuda will host the ITU World Triathlon Grand Final in 2021. The island’s bid won favour with the ITU Executive Board today in Queensland, Australia. “In the World Triathlon Series Bermuda 2018 Impact Study, PricewaterhouseCoopers wrote: ‘Based on prior WTS Grand Final events, approximately 3,000 athletes are expected to participate in the age-group race, with 55 men and 55 women in the elite race and 100 para-triathletes. “The estimate from PwC would represent a ten-fold return on the $1.6 million public investment. The study also estimates the total cost to host the event is $3.5 million, of which $1.6 million will be Government-funded with the remaining amount expected to come from corporate sponsors. Bermuda Tourism Authority CEO Kevin Dallas said: “While winning the ITU World Triathlon Series was an awesome achievement, winning the Grand Final has been our ambition from the beginning. “This is an amazing milestone in Bermuda’s journey to become a premier sports tourism destination. Congratulations to all involved in the bid process. I have full confidence that Bermuda will seize this incredible multiyear opportunity to show the world how we skilfully execute high-profile events out here. Update September 12, 7.25am: The “decision to base the ITU World Triathlon Grand Final 2021 in Bermuda has its roots in the successful policies implemented by the One Bermuda Alliance, “according to Justin Mathias, the OBA spokesperson for Tourism in Senate. “We set up the Bermuda Tourism Authority which has been tremendously successful in attracting high profile events to Bermuda. Taking politics out of tourism and allowing the BTA to operate independently has been an overwhelming success, as we have seen with increasing visitor numbers,” he said. “Bringing the America’s Cup to Bermuda also showed that the Island is capable of hosting huge sporting events. It showcased the Island not just to tourists but to sporting authorities around the world. “Hosting the ITU World Triathlon Grand Final will bring very significant revenue to the Island. The World Triathlon Series earlier this year had a $4.4m impact on the Island’s GDP and generated a 152 percent return on investment. “The Final will have an even bigger impact that will benefit the entire Island. 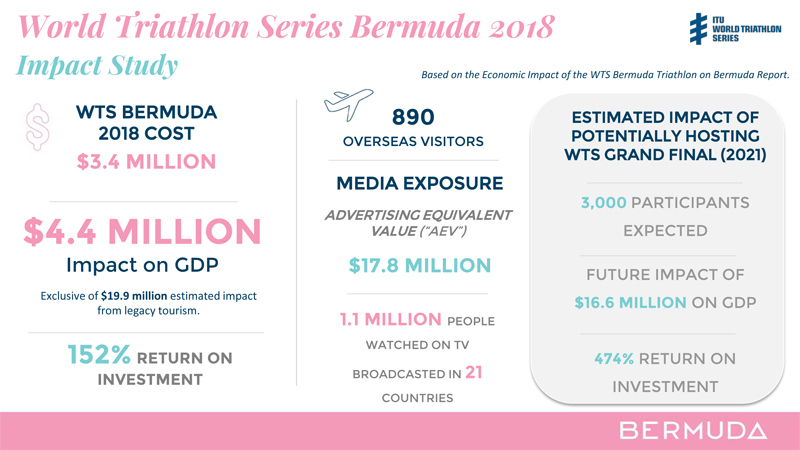 PwC, in its World Triathlon Series Bermuda 2018 Impact Study, said that spending on-island as a result of hosting the Grand Final could be in the region of $13 million. That will be a tremendous boost for the economy. Wow, it just gets better! Congrats to all involved with the bid. Awesome news! great job to all that had a hand in this. Man, I’m so excited I’m going to open a cereal bar for the athletes. Hopefully there won’t be any immature self-important dopes sexually harassing the workers. Well done BTA and the team involved. This is very big news and gives Bermuda another opportunity to show the world our best hospitality skills. I can hear the crowds again shouting Flora, Flora, Flora and the names of the many our other talented athletes. Is there anyway to use Cross Island for this event? It is so sad to see that significant investment sit empty and vacant post AC35. Even if it cannot be used for the event itself, it would be great to see an event village set up there for locals so that they can watch the event on a big screen. They could have food stalls and activities set up as well, so that locals can make a day of it. Dockyard would be scenic and Cross Island an intriguing viewing area but it might be difficult to arrange a triathlon course in that area, compared to the City. I’m sure the ITU folks are considering such options. Remember though, we really had great spectator support all across the course this year. CONGRATULATIONS TO ALL THOSE HERE & ABROAD WHO NEGOTIATED THIS MAGNIFICENT DECISION. Bermuda’s Organizers & People have done REAL WELL in past International Events held here & some of these Events are STILL GOING ON, showing Our Abilities. KEEP UP THE GOODNESS BERMUDA!!! About the same as were in Bermuda for the Island Games in 2013. We did not have enough hotel beds to accommodate 3,000 people in 2013. Make shift dormitories were created in classrooms at Cedarbridge Academy and bunks at Warwick Camp were pressed into service. I hope we have a large new hotel before 2021 or we will be internationally embarrassed in 2021. Winning and delivering an event like this requires financial support beyond what the BTA can commit on its own and the support and engagement of a wide range of government ministries (Tourism, Works, Sport and Nat’l Security for a start) – by definition it has to be a whole team effort. BTA listen up…this event will be broadcast around the world. This is a time for Bermuda to shine…forget Hamilton Harbour…we want to see the swimmers swimming in our crystal blue south shore waters and running alongside our picturesque south shore beaches. Please set up the course where it showcases our beauty! As was discussed around this year’s Series event, the course is the ITU’s decision, not BTA’s. The final route balances tourism objectives and ITU objectives with athlete needs and public safety and convenience. The result is a unique urban course that showcases a different – but no less beautiful – side of Bermuda. It will need to be tweaked for the Grand Final, but is unlikely to change completely.